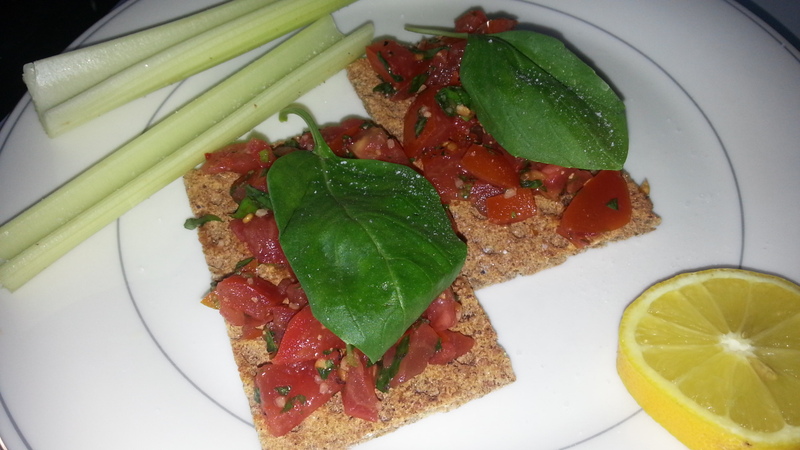 Eat Well & Sleep: Tomato Ryvita Take 3! For lunch today we had Tomato Ryvita (yes, again, I know!) I had some left over salsa from yesterday, so rather than let it go to waste, I tried a variation on the dish. So, just to recap on the salsa (link to yesterday's post), it's basically chopped tomatoes, finely chopped basil, lemon juice, dried garlic and dried chilli, all in a bowl and given a good mix. I left the Soya Cheese out today (I've given it a chance and decided I don't like it), so the salsa went straight onto the Ryvita with a fresh twist of lemon to freshen it up and a simple basil leaf laid on top. Celery sticks were a delicious compliment. I squeezed a little lemon juice over 2 sticks and a grind of salt.